Station building is in residential use. Platforms and associated buildings are demolished and their site is now woodland Goods warehouse in use by R Plevin & Sons wood processing and recycling. Notes: Micklehurst station was, in effect, a second station for Mossley. When it opened Micklehurst station was on the edge of the built-up area of Mossley, but suburban development eventually spread around it – by which time the station had closed. The station house was constructed of dark red brick with string courses of blue engineering brick and pale stone lintels. It was a dignified two-storey structure, almost square in plan, with a single-storey office range extending to the north. The roofs of both the station house and the office range were hipped and slated, with restrained cresting and finials, and a cornice was provided using a row of bricks set at 45⁰ as dentils. The original tall chimneystacks were probably of blue brick. The entrance from the road to the house was centrally placed and sheltered by a small sloping porch, with pairs of tall rectangular windows either side. Apart from the opening above the doorway, other windows were also in pairs. The entrance to the booking office was at the northern end of the ensemble, and a glazed, hipped verandah was attached to the wall above the entrance, with a deep serrated valance. The rear of the house and office range was of blue brick and directly abutted the 15-arch viaduct. The office section was provided with a series of windows but there were fewer on the rear of the house. The two facing platforms were detached from the station house and office range. They were of timber construction, about 490ft in length and built on an embankment immediately north of the viaduct. The waiting sheds/porters’ room on the platforms were also of timber construction. The use of timber, rather than masonry, for the platforms and their buildings reduced the load that the embankment carried. Access to the up platform was by means of a staircase enclosed in a timber shell with a glazed roof, and a subway and staircase led to the down platform. The up side platform building was seriously damaged by a fire which broke out in the porters’ room on 21 July 1893, possibly caused by a spark from the passing engine of a heavy goods train. The fire spread quickly, despite attempts to extinguish it: attempts hampered, it seems, because the local waterworks had turned the water off earlier in the evening since a drought had reduced the supplies. The water company restored the supply later in the evening so that a hose could be attached to a hydrant, but two local firms’ fire appliances brought the flames under control by pumping water from the Huddersfield Canal, 120yd away. The Stalybridge Reporter remarked that the damage extended to half of the ‘covered portion’ (porters’ room, waiting rooms etc. ), and that the suspension of traffic on the line owing to the fire ‘caused very little inconvenience as the traffic is very light indeed’. 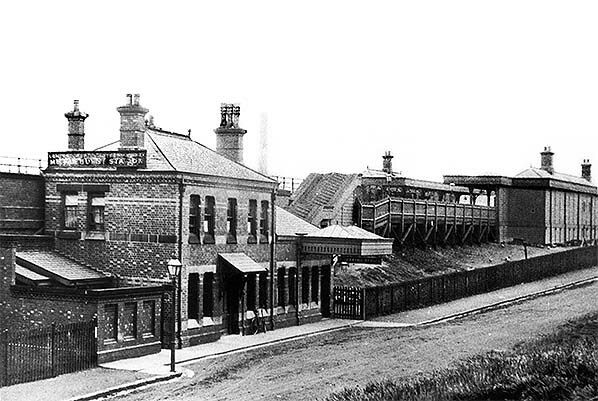 The accompanying photo (c1911) shows the station with its reconstructed platform building. The reference to traffic being very light, even in the 1890s, was to prove significant. As the timetables for 1887 and 1895 (above) show, Micklehurst – together with the other three stations on the Loop- did not enjoy a generous service; there were no trains on Sunday. Even though there were, within five-to-ten minutes’ walk of the station, three cotton mills, an iron works and a cart and carriage works and several residential streets, there was no development to the north and east. 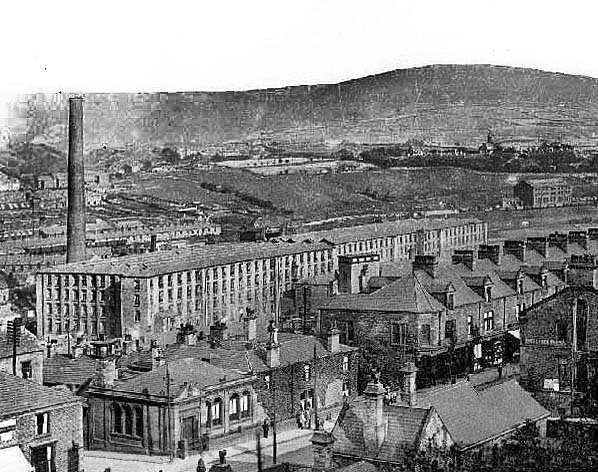 Mossley station, on the main line, was also just a few minutes’ walk from these factories and streets and much better placed to serve the town as a whole and this station had more frequent trains, operating straight through to Manchester. From Micklehurst passengers to Manchester had to change at Stalybridge. Thus it was that Micklehurst was so little used that it closed to passengers in 1907 – the first of the stations on the Loop to close, and at a time when station closures were rare. The ‘Beeching Axe’, which is carelessly given so often as the cause of all closures, had yet to be sharpened: indeed it was six years after Micklehurst’s closure that Dr Beeching was born. Goods traffic continued to be handled at Micklehurst, but the goods station was entirely separate from the passenger station, some 500yd to the south. A level site for the goods facilities was created by excavating into the hillside to the east, and to the west the embanked goods area dropped steeply to the towing path of the Huddersfield Canal. The commodious two-road goods warehouse, constructed largely of blue engineering brick, was accompanied by extensive sidings and a 10-ton yard crane. A 1925 LMS plan of the goods station shows that two 30cwt cranes were within the warehouse. Externally the warehouse had an awning on the south wall and offices and a urinal were attached at the north end. Coal shoots to a low level yard and weigh office were at the northern end of the sidings. A stable was located at the south end of the sidings on the up side. No signal cabin was provided at the passenger station but one was located west of the goods warehouse, on the down side, and separated from the through line by a siding. Wells notes a particular problem faced by the signalmen here: they needed a good supply of sticky fly-papers to deal with the unwelcome pests from the neighbouring municipal rubbish dump. Operation of the Micklehurst Loop passed from the LNWR to the London, Midland & Scottish Railway (LMS) in 1923, and then to British Railways (BR) in 1948. Micklehurst goods station closed on 19 February 1962, but freight traffic continued to pass the site and was handled for several years more at the other three stations. The occasional passenger train also used the Loop, until it officially closed to such traffic on 7 September 1964. The signal cabin at Micklehurst closed on 1 June 1964. Although Micklehurst was the earliest station of the four on the Loop to close both to passengers and goods it is the only one where the main buildings for both types of traffic still survive at the time of writing (2015). The station house is smartly presented and in residential use, and it proudly displays replica BR totems, one reading ‘Station House’ and the other ‘Micklehurst’ in something like BR(LM) maroon but not in ‘regulation’ Gill Sans typeface. Nothing remains of the platforms or their buildings. The goods warehouse is used by the R Plevin & Sons wood processing and recycling company and is flanked by modern buildings. On the western elevation a wooden structure to contain a hoist projects from the upper storeys. The goods yard provides parking and manoeuvring space for the many lorries which service the site. Bridge abutments remain in place at the northern end of the goods yard..
Other web sites: The Micklehurst Loop - Numerous archive pictures along the loop. Photographs of Micklehurst Loop passenger stations prior to closure have proved elusive. This one of Micklehurst is thought to be circa 1911; the station closed in 1907. The view is north-west across Station Road. The substantial brick villa is in the style used at all four of the Loop’s stations. In contrast the platforms and their associated buildings are of timber. The use of timber, rather than masonry, for the platforms and their buildings reduced the load that the embankment carried. A generous awning extends over the passenger entrance to the booking hall, with a more modest one over the door of the station house. The stairway up to the platform is covered, and awnings are provided in front of both of the platform buildings. The up platform building (right) was reconstructed after being severely damaged by a fire in 1893 thought to have been caused by a spark from a passing locomotive. 1892 1:500 Town Plan. The goods facilities at Micklehurst were entirely separate from the passenger station. The goods warehouse is identified as ‘Goods Station’. Two sidings pass through the warehouse; the protrusion at the northern end is the weigh office and a crane is shown at the southern end. The coal depôt with its weigh office (WM=weighing machine) is at the northern end of the site. Three further loop sidings and three dead-end ones are also shown. The goods facilities are on the up (east) side of the running lines, although one siding is to their west, as is the signal cabin: no cabin was provided at the passenger station. A level site for Micklehurst goods station had to be created by cutting into the eastern hill slope and constructing a broad embankment on the west side, presumably using the rock hewn from the eastern side. The plan shows the steep slope down to the towing path of the Huddersfield Canal, strengthened at intervals with masonry structures. Click here for a larger version. 1895 1: 10,560 map. The considerable distance between Micklehurst passenger and goods stations can be seen. Micklehurst passenger station is clearly better placed than the goods facility to serve the population of Mossley; but Mossley station, on the ‘old’ line from Diggle to Stalybridge is clearly better sited still, being adjacent to the town centre and with some residential development to the west. 1909 1: 2,500 OS map. Micklehurst passenger station has now closed, but was probably open when the survey and drawing were done. The platform roofing is indicated by pecked lines at the edges of the canopies. Urban and industrial development is in progress close to the station, with an oil and grease works to the west, and All Saints’ church and a residential terrace (King Street) recently constructed to the east. 1922 1: 2,500 OS map. Micklehurst passenger station is no longer identified by name, having closed 15 years earlier, and it seems that the timber platforms and their buildings have been demolished. The station house and booking hall are in place – as they still are in 2015. 1955-56 1: 2,500 map. ‘Micklehurst Goods Station’ is now named on the map, adjacent to the original goods warehouse. A second goods shed is named at the southern end of the yard where the stable used to stand. Little else has changed. Click here for a larger version. Looking south-east towards Micklehurst station circa 1911. The rear of the down platform’s timber building can be seen. The prominent spire of All Saints’ Church (founded 1895) is beyond the station. 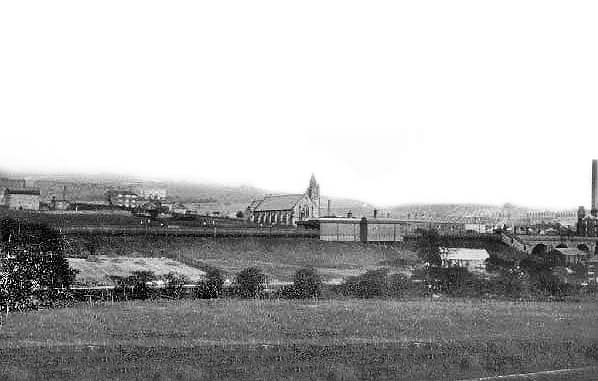 Looking south-east across Mossley town centre c1910 towards Micklehurst goods station. The goods warehouse can be seen in the distance towards the right-hand edge of the photo. In the foreground, lower right, is Mossley station on the ‘old’ line between Diggle and Stalybridge; this station is still open in 2015. The view is dominated by the two South End cotton mills. Looking east towards Micklehurst goods station c1910. The goods warehouse is just left of centre. 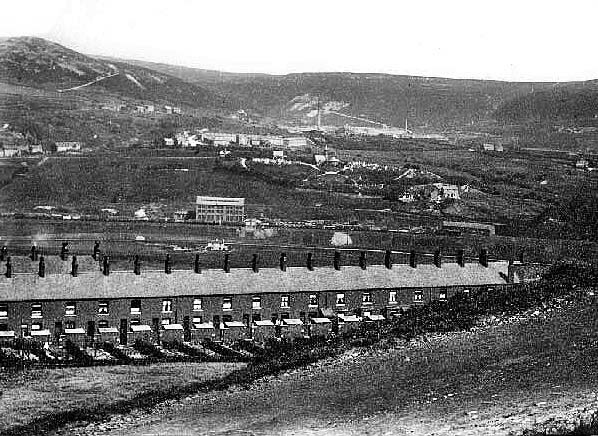 The terraced houses of Andrew Street stretch across the view.